What is going on with Hong Kong cinema and local film distributors?! Starting off with something positive: for the first time in a long time -- maybe even since I moved to Hong Kong close to 12 years ago now -- there are six Hong Kong movies (if you include a Mainland China-Hong Kong co-production directed by local comedy darling Stephen Chow) currently playing in local multiplexes. Now for the negative: the best by quite a long chalk of the three Hong Kong movies I've most recently viewed is the one that's been given the least publicity and fewest cinema screens to appear on. 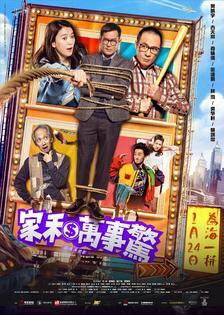 With the kind of theme (housing woes) and tone (dark, even sad) that hardly screams out "Chinese New Year movie", A Home with a View also appears to have been dumped into cinemas -- after being completed a year ago and then seeing its original summer 2018 release date come and go -- and made to fight for scraps against the odds in a crowded festive field. Adapted from a play by Cheung Tat Ming (who also scripted the film as well as co-stars in and co-produced it), A Home with a View is a black comedy-drama about a family struggling to make ends meet as a result of being saddled with a hefty, multi-year mortgage for a not particularly physically impressive home that does have one major asset: its unimpeded harbor view. However, they find that which gives them great psychological comfort suddenly taken away one day by a rooftop home owner whose money-making plans involve putting up illegal as well as large billboard structures atop highrise buildings. Already living in conditions that are far from ideal (due to such as five very different personalities living together in uncomfortably close proximity and being saddled with neighbors whose habits are annoying when faced with day after day for some years), this latest frustration threatens their very sanity. Unwilling to take this latest obstacle to their collective happiness lying down, they come up with various schemes to get rid of the annoying structure that get increasingly desperate but also imaginative. As someone who's also had to deal with some of the annoyances faced by the Lo family over the course of my time in Hong Kong, I really can relate to a number of the situations shown in the movie. And since I sincerely doubt that our cases are that rare, my sense is that there are many people out there would have some sympathy for, and fellow feeling with, at least one or more of its members: be it the patriarch trying to hold everything together even while feeling crushed by his circumstances (Francis Ng), his unhappy see lai wife (Anita Yuen), his infirm father too aware of his being burden on the family (Cheung Tat Ming), his jobless graduate son (Ng Siu Hin) and his secondary student daughter in search of peace and quiet when studying (Jocelyn Choi). Francis Ng and Co also make it easy to feel their frustrations and identify with their situation because they also are a sterling bunch of thespians (who include, lest it forget, a two time Hong Kong Film Awards best actress winner in Anita Yuen). So even while their histrionics do seem on the theatrical as well as hysterical side at times, particularly when appearing alongside someone as emotionally stunted as Louis Koo's loner businessman character, they still can seem understandable and even called for. Also possessing a theatrical feel are the sets in A Home with a View. Rather than chalk it off to the film's theatre origins though, I'm inclined to ascribe it to the restricted budget that its makers probably had to work with. Especially in view of this offering not having received as much financial and other support as it deserved, I think Herman Yau and the others who worked on it deserve major credit for making the movie not only very watchable but also delivering so well the kind of salient messages that Hong Kong's goverment and bureaucrats really should hear and take heed of if they really care about Hong Kong (but, from past experience, I'm not going to hold their breath that they will, and do). Judging by your scores, this is easily the best CNY HK film of 2019. It's a pity that it seems to have been ignored by most people. Perhaps things would have been different had Cheung Tat Ming and Francis Ng's old friend Dayo Wong was also in it! By the way, are you going to skip Stephen Chow's new film? Totally re "A Home with a View" being my favorite HK film viewed thus far in 2019. And yes, I think I will skip Stephen Chow's new film... though it's true that I liked "Mermaid" far more than I expected.